Dictionary of France - T : Tabac to Tutoyer. When did the first TGV run in France ? What is TF 1 ?And when was the Tour Eiffel built ? And what is the Tiercé ? Answers to these questions and plenty more on this page of the dictionary of France. Tabac brun - Brown tobacco : (Also called black tobacco in English) Until the 1980s, most of the cigarettes smoked in France were French brands, made with brown tobacco, a stronger more pungent version of tobacco than the classic blond tobacco of the new world. The tobacco was either grown in France, or imported from the Near East (Turkey in particular). The three most popular brands were Gauloises, Gitanes and Disque Bleu. Brown tobacco was popular throughout southern Europe. Today, in a country that is more health conscious and where smoking bans are in force, brown tobacco has gone out of favour; the once famous French brands are now no longer manufactured in France. Tabloid press : France does not have a “tabloid press�? in the way that the UK has the Sun and the Mirror, or Germany has Bild Zeitung. There are no national daily tabloids, since the daily press in France is largely a regional press, with one or at most two middle-of-the range regional dailies per region. The main national newspapers, such as le Monde and le Figaro, are quality dailies, with relatively low circulation. No paper in France has the massive circulation, and thus influence, of the British or German tabloids. The nearest French equivalents to “the tabloids�? are France Dimanche and Ici Paris, which are more “people�? weeklies than “tabloid press.�? For more information see article on Daily newspapers in France. Tancarville, Pont de - Suspension bridge across the estuary of the Seine, near Le Havre. When it was opened in 1959, it had the longest central span in Europe (608 metres)..
Tapie, Bernard - Flamboyant French businessman, former owner of Adidas and the Olympique Marseille football club. Tapie was also for two short periods (1992 - 93) Minister for Towns in the Socialist government of Pierre Bérégovoy. Tapie also had several run-ins with the law for financial and fiscal reasons, and received a prison sentence in 2005 for tax fraud. Tati, Jacques (1907 -1982) - French film director, best remembered for his comedies, notably Les Vacances de Monsieur Hulot (1953) and Trafic (1971). Taxe d'habitation - residence tax, one of the local taxes due in France. Monies raised from this tax go to local authorities, and are divided between the different levels of these. Since 2005, the television licence fee (redevance) has been billed to people with the tax on their principal residence. Taxe foncier - land tax, rates. TER - Transport Express Régional, or Train Express Régional. Express regional transport services, mostly trains but also coach services. Since 2002, following pilot projects in certain regions, the planning of TER services and the fixing of ticket prices has been devolved from central government to the Conseils Régionaux. Regional management of the services has led to a considerable development of services in many regions, to new train sets, and to the upgrading, at the regions' behest, of many regional or inter-regional routes. TER services, much used by commuters and young people, are heavily subsidised. TF 1 - the most popular commercial French TV channel, formerly the first channel of the state television network, before it was privatised. TGV Train Grande Vitesse : High speed train. France has Europe's oldest and most extensive network of dedicated high-speed railway lines. The TGV entered service in 1981, and the Paris-Lyon dedicated line was largely completed in 1983, bringing journey times betwen the two cities down to just 2 hours. At present, the network consists of some 1700 km (over 1000 miles) of dedicated high-speed track, comprising four routes radiating out from Paris. An "interconnection" route round the south and west of Paris allows high-speed connections between the routes, notably allowing north-south TGVs to avoid the centre of Paris. Depending on the stock and the route, TGVs travel at speeds up to 270 km/hr or 320 km/hr. The TGV holds the current officially recorded world rail speed record, of 574.8 km/hr (357.2 m.p.h.). Thalys: the high-speed train service linking Paris, Brussels and Amsterdam. The carriages are painted maroon. Thibaud, Bernard, Current (2009-2013) leader of the CGT trade union. Thirty five hour week. See trente-cinq heures, below. Tiercé : Very popular form of betting on horse-races in France. The Tiercé involves guessing the first three horses in a race, and money is paid out to those who get the result ‘in the order’ or ‘out of order’. There is also prize-money for getting two out of the three. Since its introduction, a version involving the first five horses, called the Quinté, has supplanted the tiercé as the most popular form of betting in France. The Tiercé is managed by the PMU. Tiers provisionnel: for people paying their income-tax in three payments, the first annual payment, whose amount is calculated on the basis of the total tax paid the previous year. Tixier-Vignancourt, Jean-Louis (1907-1989)- Lawyer and right-wing nationalist politician who was a candidate in the presidential elections in 1965, where his campaign manager was Jean-Marie Le Pen. TOM. The Térritoires d'Outre Mer.The last four existing French colonies, namely French Polynesia, New Caledonia, Wallis and Fatuna, and the French Antarctic Territories. Tomme - word used to describe a number of different cheeses in France, particularly pressed cheeses. Examples tomme des Pyrénées, or Tomme de Savoie. Total : France's biggest oil company, and the fourth largest oil company in the world. A CAC-40 company. Prior to 2003, Total was called Total-Fina-Elf, indicating the three historic oil companies in the group. Total is the largest capitalisation on the French stock exchange. Toulon: Port city, and capital of the Var department (83), Toulon is the site of the main French naval base on the Mediterranean, and home of the Mediterranean fleet. Tour de France - the world's premier Cycling race. See detailed article. Tour Eiffel : The Eiffel Tower, Paris, a monument built by the engineer Gustave Eiffel, for the Paris Universal Exhibition of 1889. The 325 metre high tower has become the symbol of Paris, and is the world's no.1 paid-entry tourist attraction, with over 6 million visitors in 2007. Toussaint : 1st November, All Saints Day. a public holiday in France. On this day, the French traditionally visit the graves of their ancestors, and decorate them with flowers. Transilien : (adj) Name applied to the Paris suburban transport network, Transport for the Ile de France. Trente-cinq heures, les : (see also RTT) In the year 2000, the socialist government of Lionel Jospin reduced the statutory working week in France from 39 hours to 35 hours - without loss of salary. Though the measure was accompanied by other changes in workplace legislation, including greater flexibility for employers and employees, and though the productivity of labour in France increased by over 4% as a result, the introduction of the 35-hour working week was not a good move for the French economy, particularly at a time of increasing globalization, and the rapid development of imports manufactured in low-labour-cost countries. The conservative Raffarin and Villepin governments tinkered with reform of the system that was much decried by employers, but failed to take any major action for fear of the trade unions and of hostile public reaction. It was not until the Sarkozy presidency that the official 35-hour working week legislation was to all intents and purposes rendered obsolete. Tribunal Administratif. Branch of the judiciary whose specific purpose is to hear complaints brought by citizens against public bodies and administrations. Examples include investors suing la Poste, the French Post Office, for having given them flawed investment advice, or students complaining about irregularities in the organisation of exams in the Education Nationale. Tribunal correctionnel. The most common form of criminal court, for the hearing of cases involving minor offences. See also Cour d'Assise. Tribunal de Grande Instance. The main civil courts in the French legal system. Tribunal d'Instance : The lowest level in the hierarchy of the French courts system, for the hearing of small cases. The Tribunal d'Instance is the French equivalent of a UK Magistrate's Court, except for the fact that a TI is overseen by a juge, a stipendiary magistrate (i.e. a trained jurist, paid for the job) , not by Justices of the Peace (unpaid volunteer citizens). The concept of Justice of the Peace, as found in many English-speaking countries, does not exist in the French legal system. Tricolore. The French flag, composed of three equal vertical bands or blue, white and red. Originally, the red and the blue were the colours of the Paris national guard, and the white was the colour of French royalty. The design of the flag is generally attributed to General Lafayette in 1789. Trois Vallées, les : The biggest interconnected skiing area in France, and in the world, lying in the middle of the French Alps. Les Trois Vallées is based on three major ski resorts, Courchevel, Val thorens and Les Menuires. Turboprof : teacher, notably in French university , commuting for one or two days a week to ensure teaching commitments in a provincial university. Turbotrain : nineteen-seventies express diesel multiple-unit trains, designed to improve and speed-up train services on major rail routes in France that were not equipped for electric traction. Tutoyer : To use the pronoun tu rather than vous - a concept that English-speakers often find hard to master correctly, tutoyer means addressing someone using the familiar singular tu form of the second person pronoun, rather than the more formal vous form. Fifty years ago, in formal family circles, children would address their parents using vous rather than tu; this practice has now more or less completely disappeared, and tutoiement is the common form of address within families and within groups of friends or workplace colleagues who know each other. The change is generational, and President Sarkozy has brought tutoiement right into the formal surroundings of presidential affairs. Vouvoiement (using vous) remains the norm in formal circumstances, when addressing a hierarchical superior, a stranger or someone with whom one has only occasional working relations - though the French are now quite used to speakers of other languages, notably English-speakers, getting it wrong. Usage in France varies from usage in Quebec, where speakers often use "tu" as a singular form of "vous" to address each other even in a business context or between strangers. TVA – Taxe sur la Valeur Ajoutée. French Value Added Tax, or sales tax. The main rate in 2013 was 19.6%, and the reduced rate 5.5%. As is the custom throughout Europe, prices displayed at retail level, i.e. in shops, restaurants, hotels, domestic e-commerce websites, always include TVA, so there is nothing to be added to the price indicated when the customer comes to pay. On the other hand, prices listed for B-to-B (business to business) sales are normally indicated "hors taxe", i.e. excluding tax, since businesses will pay the tax but then reclaim it (if registered for VAT in France), or else be billed without tax in the case of cross-border sales to companies VAT registered in another European Union country. 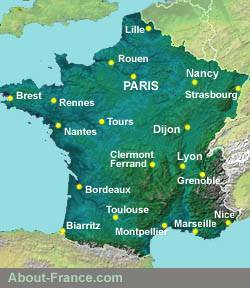 Website photos and text © About-France.com 2003 - 2019 except where otherwise indicated.